4Pockets.com released three new AUv3 Plugins! There is an Audio Expander to increase dynamic range, an Audio Compressor, and a graphical Parametric Equalizer. They can be purchased individually or as a bundle. This is an AUv3 compatible audio expander which can be used as a plugin with your favourite DAW such as Cubasis, Meteor, Auria or GarageBand. 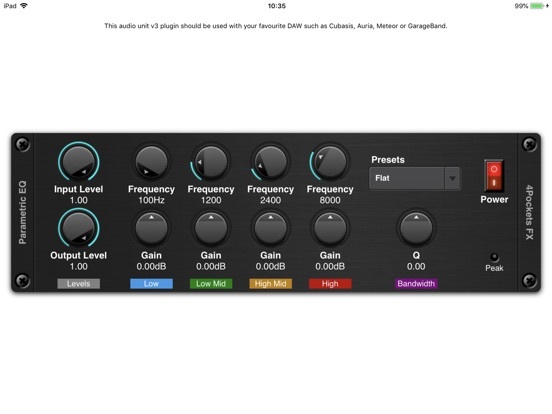 It supports a graphical interface and presets with stereo metering to monitor signal levels. The expander can be used to increase the dynamic range of the audio signal by reducing specific bandwidths that fall below a specified threshold. This is essentially the opposite of a compressor and can be used when you have a noisy recording and want to reduce the volume of the quieter parts to reduce noise. Expanders are also great for enhancing drum tracks creating gated effects which give your drum tracks more punch. 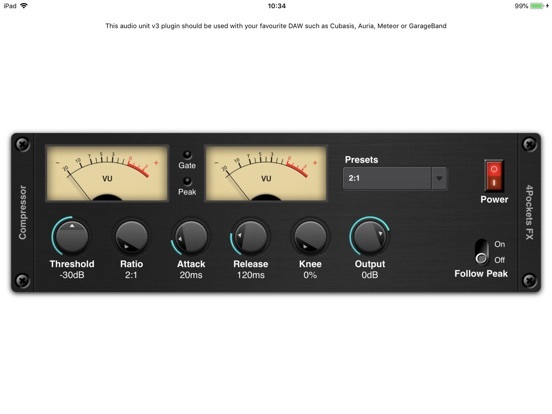 This is one of a suite of AUv3 compatible plugins which will also be available from 4Pockets. This is an AUv3 compatible stereo parametric equalizer which can be used as a plugin with your favourite DAW such as Cubasis, Meteor, Auria or GarageBand. It supports a graphical interface and presets with stereo metering to monitor signal levels. The equalizer allows you to define up to 4 frequency bands which can be cut/boosted up to 24dB. The Parametric EQ is a mainstay of recording and live sound production. In professional audio circles, equalization is a highly sophisticated art that can be used to sculpt the tone of instruments in a mix, counteract anomalies in a room, or just pump up the bass. This 4-band stereo EQ allows you to control of the gain (boost/cut) of low, midrange, and high frequency bands. Use the Q knob to adjust the ratio of the center frequency to the bandwidth. This type of EQ is great for guitars in order to emphesise certain harmonic frequencies or to remove unwanted narrowband noise. 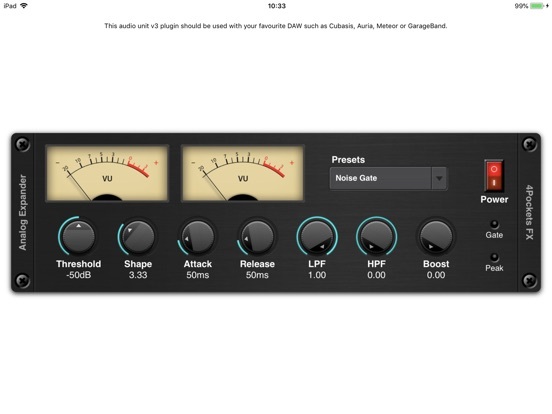 I’m buying this one immediately just for the VU meters, anything else it brings to the table is a bonus. An expander is a surprisingly useful thing. LOL! They are some nice looking "virtual analog" VU meters. You know I didn’t even realize that was 3 apps until now. I remember being mad because I didn’t get the Waves VU plug-in when it was first introduced and free, then they priced it at $30. But I found this excellent free VAT/AU for DAWs. Love me some quality VU action. are these just bits of Stompbox ripped out and made into AU? They look nice... i guess. You can get all 3 as a suite for $11.99. @Humbuzz: Good tip! I've added the link to the article.